He grimaced as he looked up at his mentor who smiled broadly, showing very little pity for his young protege. Life is full of pebbles that find their way into our shoes. They could be relationship issues, financial issues or problems at work. 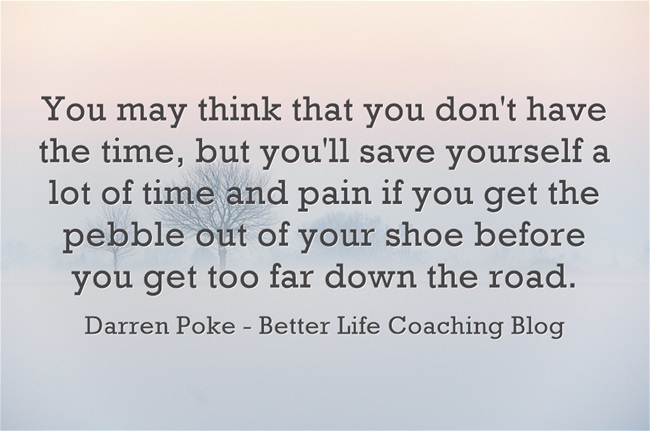 Let me encourage you today to take the time to deal with problem now before they cause you too much pain and cost you time in the future. Awesome! Do you mind if I use this in my newsletter? Hi Delmar, feel free to use this. If you could mention the source, that would be appreciated.